The United States Army Medical Research Institute of Chemical Defense (USAMRICD) located in Aberdeen Proving Ground, Maryland, is a research and training laboratory dedicated to advancing the treatments that alleviate the suffering caused by chemical weapons and developing new materials that aid in those treatments. Researchers at the laboratory include experts in physiology, toxicology, pathology and biochemistry. 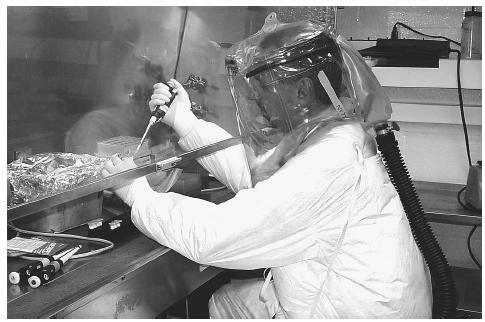 A research scientist processes anthrax samples that are thought to contain a significant aerosol and respiratory hazard. current name in 1981. Today, the USAMRICD is one of six laboratories and institutes under the authority of the U.S. Army Medical Research and Materiel Command. Researchers at the USAMRICD have made hundreds of contributions to the scientific literature and have produced technical bulletins on procedures for collecting, handling, shipping, and preparing samples of chemical agents. The laboratory also operates a chemical surety facility. Along with its research charge, the USAMRICD is also a training institution. The Chemical Casualty Care Division (CCCD) provides courses in the management and treatment of chemical weapons injuries to medical professionals. Courses are offered at the laboratory, at off-site locations and as computer-based training. Much of the educational and training work of the USAMRICD is done in partnership with the United States Army Medical Research Institute of Infectious Disease (USAMRIID) in Fort Detrick, Maryland, which is the Army's primary laboratory for research into biological warfare agents. United States Army < http://mrmc-www.army.mil/ > (April 10, 2003). United States Army Medical Research Institute of Chemical Defense < http://chemdef.apgea.army.mil/ > (April 10, 2003).